Nearly 3 in 5 babies (or 60%) are born with jaundice, a condition that leaves their skin and eyes with a yellowish tint due to excess bilirubin in their blood. In most cases, newborns will recover without treatment or receive phototherapy treatment within their first week or two of life. But for babies born in under-resourced countries in hospital clinics that lack access to adequate power supplies or expensive phototherapy devices, mortality rates are startling, and untreated conditions run the risk of leading to brain damage and deafness. Design That Matters is cracking the code on this problem with their recent introduction of Firefly—a compact double-sided LED phototherapy device that uses minimal power and could cost as little as $1.50 per child. Typical phototherapy devices in American hospitals run up to $3,000. Compact fluorescent light bulb replacements are equally expensive adding an additional $17 each to maintain the device. Low-resource clinics don’t have the luxury of replacing expensive bulbs, nor maintaining devices (if available) that break down. 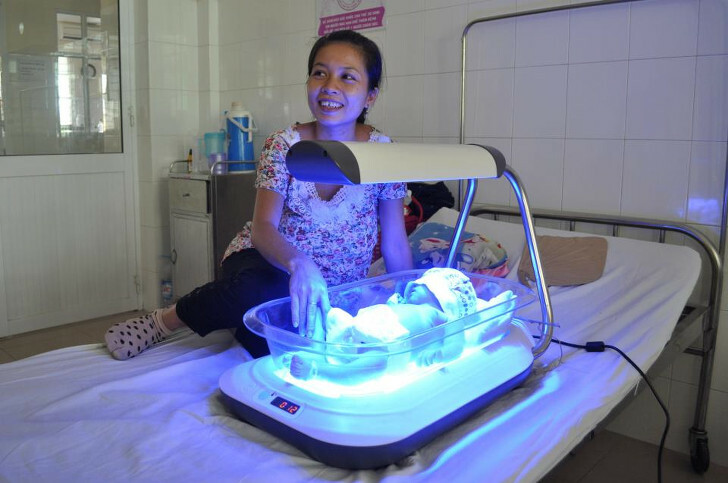 The Firefly phototherapy device—a project collaboration with the East Meets West Foundation and Vietnamese Manufacturer MTTS—is an intuitive design that provides one-button, above-and-below, long-life LED phototherapy that is easy to use and emits 70% less energy than traditional devices. Firefly is placed in the mother’s room during treatment where they are able to monitor their babies—an attribute that supports breastfeeding and frees up critical resources and staff. With a shelf life of 5 years, the double-sided LED design reduces treatment time by 40%, allowing for quicker discharge time and reducing infant exposure to potential infections. Last month, Firefly distributed 50 devices to Vietnam, Myanmar, Thailand, Malaysia and Ghana. With plans to deliver 1,000 Firefly devices to additional countries, Design That Matters estimates that these devices will reach over 500,000 newborns. Learn more about these unique phototherapy devices when you visit Design That Matters. Nearly 3 in 5 babies (or 60%) are born with jaundice, a condition that leaves their skin and eyes with a yellowish tint due to excess bilirubin in their blood. In most cases, newborns will recover without treatment or receive phototherapy treatment within their first week or two of life. But for babies born in under-resourced countries in hospital clinics that lack access to adequate power supplies or expensive phototherapy devices, mortality rates are startling, and untreated conditions run the risk of leading to brain damage and deafness. Design That Matters is cracking the code on this problem with their recent introduction of Firefly�a compact double-sided LED phototherapy device that uses minimal power and could cost as little as $1.50 per child.